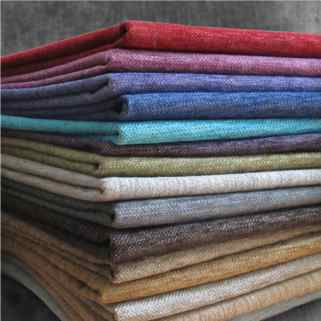 At Loome we have one of the best collections of chenille fabric online. Some of these are washable, all are wipeable, and some are extra soft (achieved by pre-wash and tumble). We have both plain and patterned chenille fabric, and an extensive range of colours. Chenille, named after the French word for caterpillar, is manufactured by placing short lengths of yarn, the "pile", between two "core yarns" and then twisting the yarn together. The edges of these piles stand at right angles from the core yarn, giving chenille fabric both its softness and its characteristic iridescent look. The soft comfortable feel of chenille makes it ideal for sofa upholstery, and the iridescent look, having a different appearance if viewed from different angles, gives the fabric a plush high quality finish. Although chenille upholstery fabric can be made from natural fibres such as cotton, it is now more often made from man-made fibres such as polyester and acrylic. Lighter weight chenilles are ideal for making loose covers for sofas or throws. Medium and heavier weight chenilles are perfect for curtains and upholstery. The fabric has what is known as a "nap"; when you run your hand down the length of the cloth it will feel smooth in one direction and rough in the other. The appearance of the chenille is affected by the nap, appearing darker in the direction in which the nap runs up. When chenille is used to cover a sofa or to make curtains, care should be taken to ensure that the nap is running in the same direction on all surfaces. Chenille is a hard wearing fabric and has excellent durability in normal use, However, to keep it looking its best it is a good idea to vacuum it occasionally, preferably using a brush attachment. This reduces the build up of any dust which could otherwise dull the colour of the fabric. Vacuuming or brushing also helps to reduce `pile pressure' - an alteration in the lie of the pile which is visible as a change in shade of the fabric in the area affected. Pile pressure occurs in any tufted fabric if it is consistently pressed down in one direction or place. It does not indicate a fabric fault nor does it detract from the durability of the material. Synthetic chenille fabrics are generally resistant to stains, but any spills should be wiped up immediately, and the area cleaned with a damp cloth using, if necessary, a very little mild soap. Many of our chenilles are washable. As with all fabrics, care should be taken to try to avoid leaving the fabric in strong direct sunlight as this can cause fading of the colour. Similarly, one should avoid direct heat such as leaning a chair against a radiator. Never iron chenille as this will crush the pile and may result in permanent imprinting.